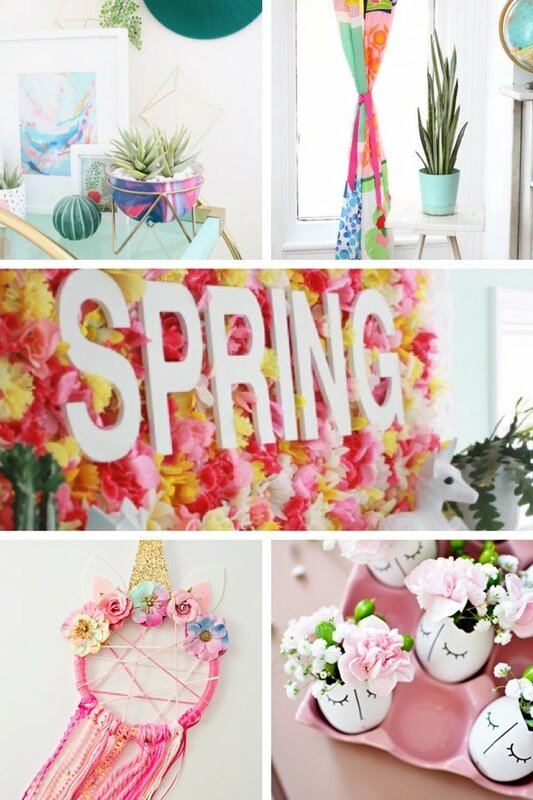 Spring has to be one of the most beautiful times of the year, and offers some of the best opportunities to bring the outside in and welcome the season into your home! 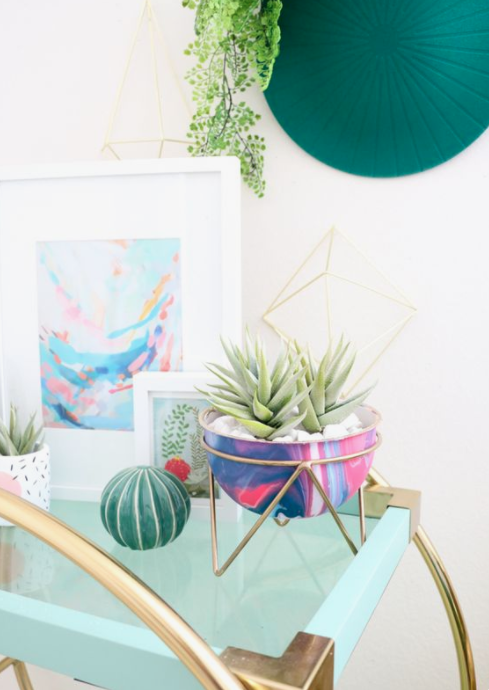 It’s amazing how just one simple stylish touch can add atmosphere and beauty to any room, and whether that means embarking on a weekend DIY Spring decor project, or a quick and easy floral display, is up to you. 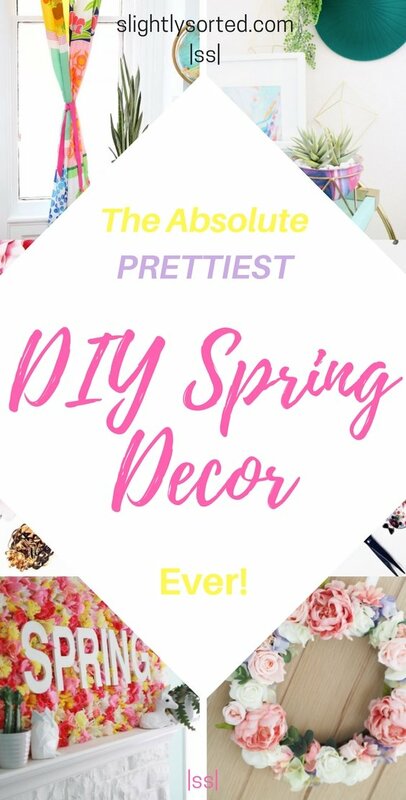 I’ve scoped out some of the most beautiful, stylish, and accessible DIY Spring decor projects around, to give you some seasonal inspiration for beautifying your home for Spring! 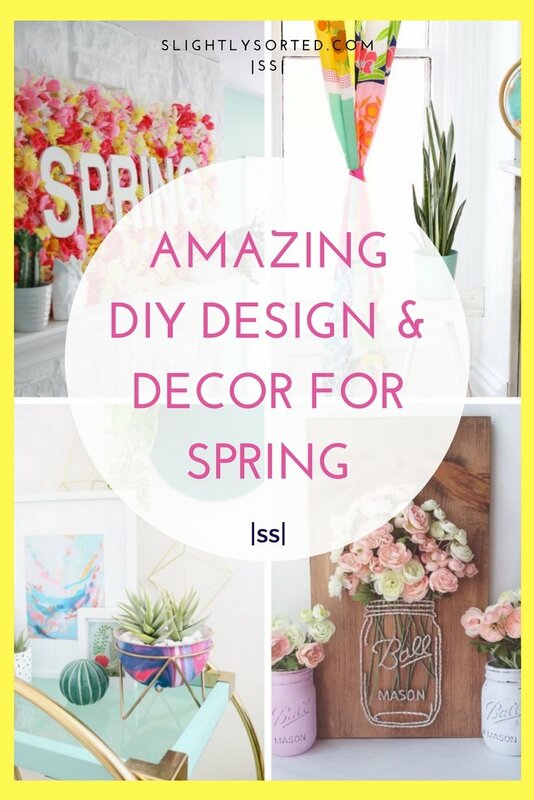 Let’s kick off with a DIY Spring decor project that’ll leave no-one in any doubt that Spring has sprung! 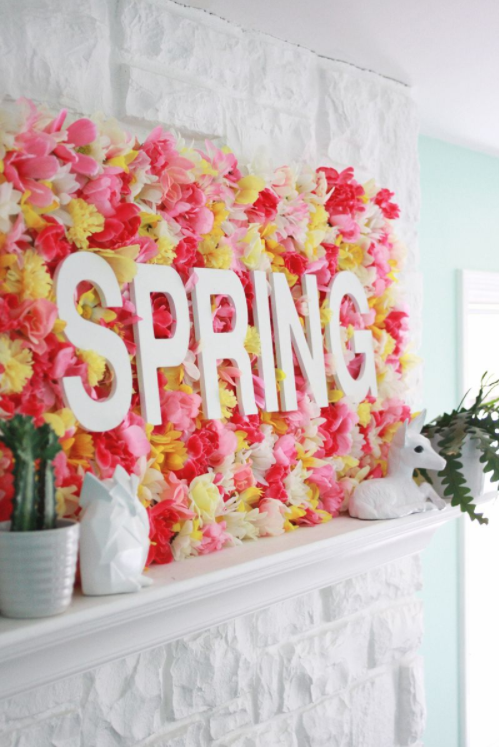 This gorgeous Spring Wallflower sign clearly isn’t a quick and easy project, but that said it’s actually fairly simple to recreate. 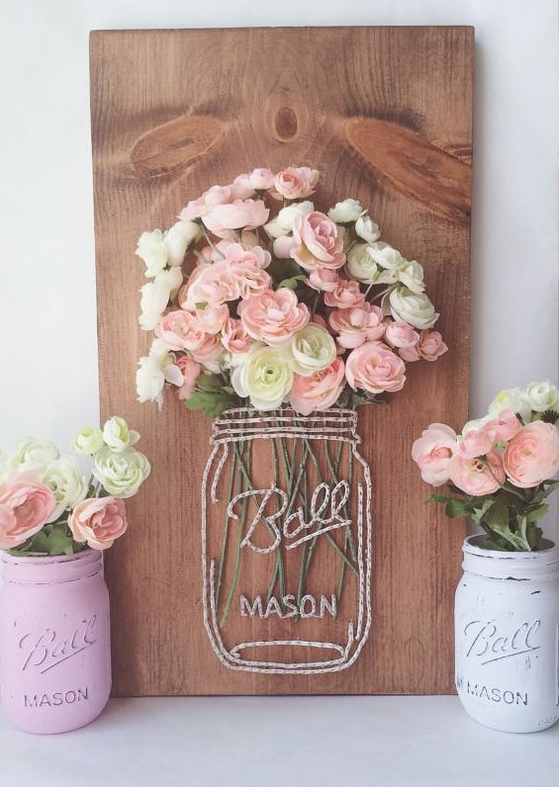 You just need a wood board, wooden letters, a glue gun, plastic plug caps, and a ton of fake flowers (about 250!). The tutorial on abeautifulmess.com says it cost them around $5o for all the flowers, which isn’t too bad for such an amazing piece of DIY art. That said though, you could just make a smaller version if you wanted a lower-budget alternative. I love this and I think I’d look forward to getting it out year after year to welcome in the new season! This is a quicker and simpler project that’ll brighten up your whole room! I think if I were doing this I’d paint in really bright colors, but you could stick to pastels for a more traditional Spring feel. And of course, you don’t actually need a fireplace, you could just make a rustic-style feature out of a pile of logs. You can find all the details on theartofdoingstuff.com. This gorgeous string art has got to be one of the most original DIY Spring decor ideas I’ve seen! It’s simple, but really eyecatching and sure to be a definite talking point once you get it up on the wall. The tutorialÂ for this advises just nailing the flowers to the plank of wood. You can find a really good simple YouTube tutorial on something very similar here. 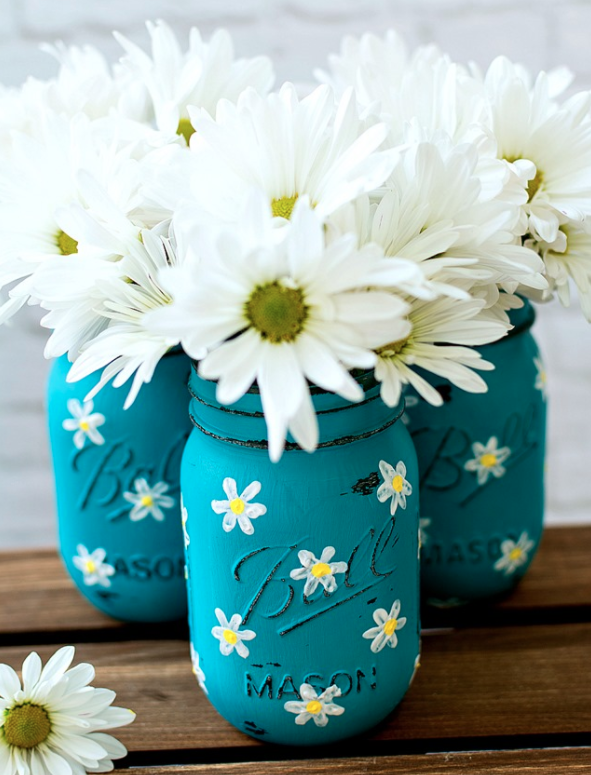 And while we’re on the subject of good old mason jars, if you’re after a smaller DIY Spring decor project, then these pretty painted jars may be for you! 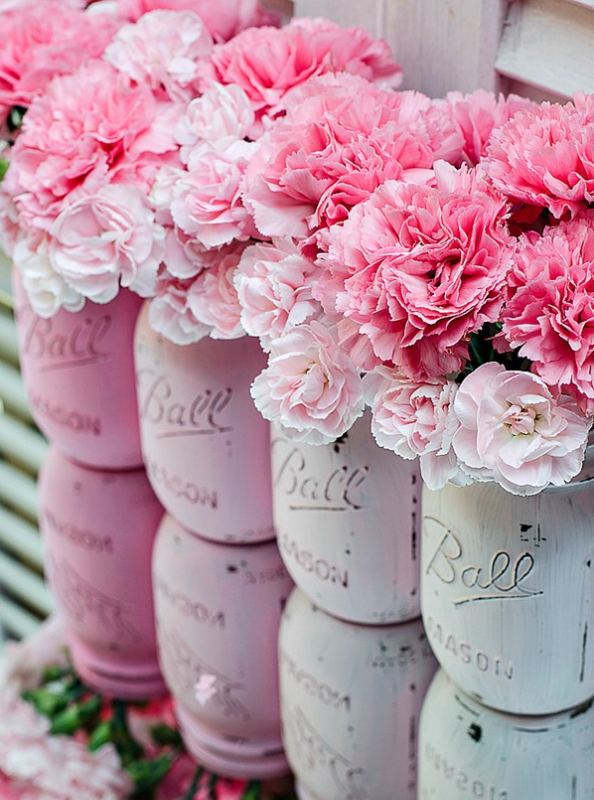 Filled with gorgeous pink blooms, they’re unmistakeably ‘Spring’, yet such an easy and simple idea. That said, if you want a really good finish on your mason jars, you need to do a bit more than just whack some paint on. These ones are from masonjarcraftslove.com, and there’s a detailed tutorial on getting the perfect finish. If you’re not a ‘pink’ person, maybe try out these pretty ones below? If you need to stock up on mason jars, you can usually find good bargains on Amazon. 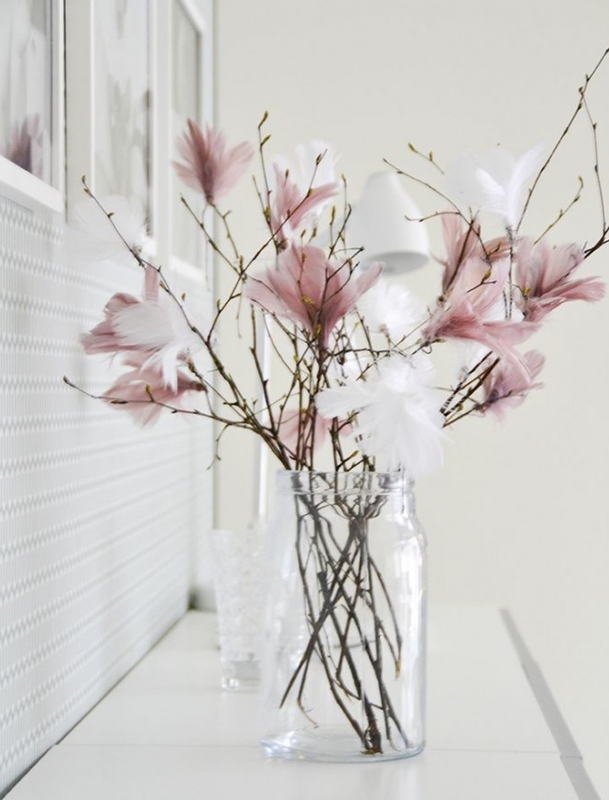 If you fancy something other than traditional spring blooms for your mason jars, how about this beautiful Scandinavian-style feather arrangement from littlescandinavian.com? I think this is perfect for Spring, and it’s nice to have something a bit different. Sticking with the botanical theme, what do you think of this pretty marbled planter? You could do this in bright or pastel colors depending on what kind of a spring look you’re going for, and you could of course choose to do a vase rather than a planter if you wanted to stick with flowers. You’ll get the full tutorial for this on akaliochiclife.com. 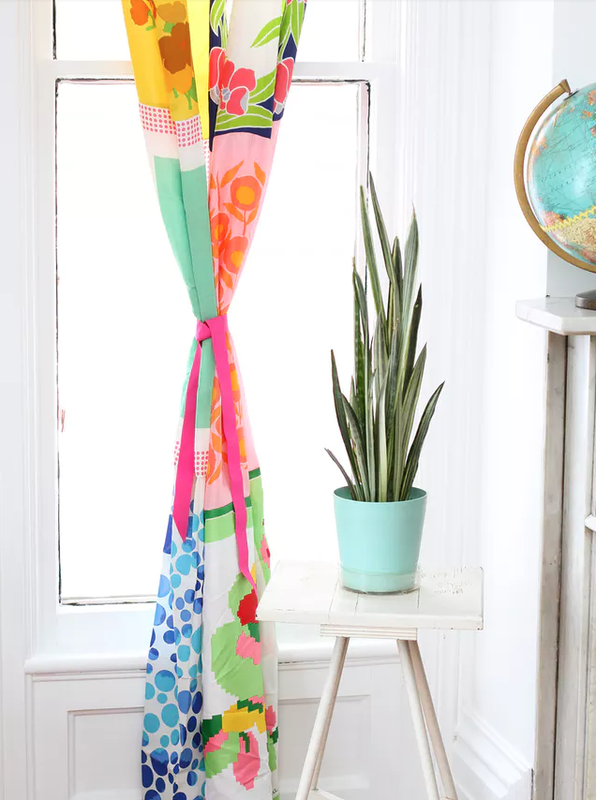 For an inexpensive and simple way to brighten up a room for Spring, how about creating a beautiful curtain made from vintage scarves? 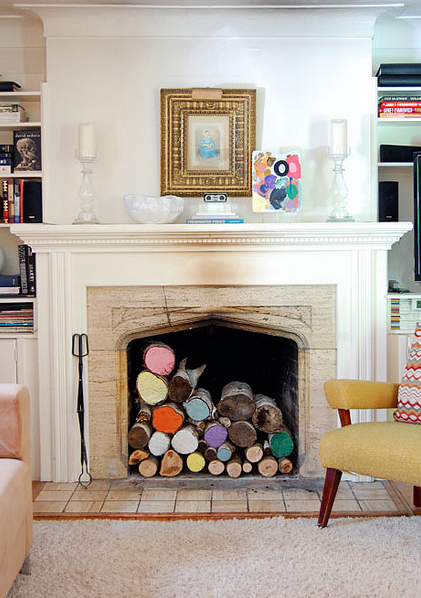 This lovely idea from apartmenttherapy.com can be made to fit in with your color theme, but will look equally good with a multitude of colors and scarves of different designs – it’ll be completely unique to you, and you can often pick up pretty scarves very cheaply at flea markets and charity stores. 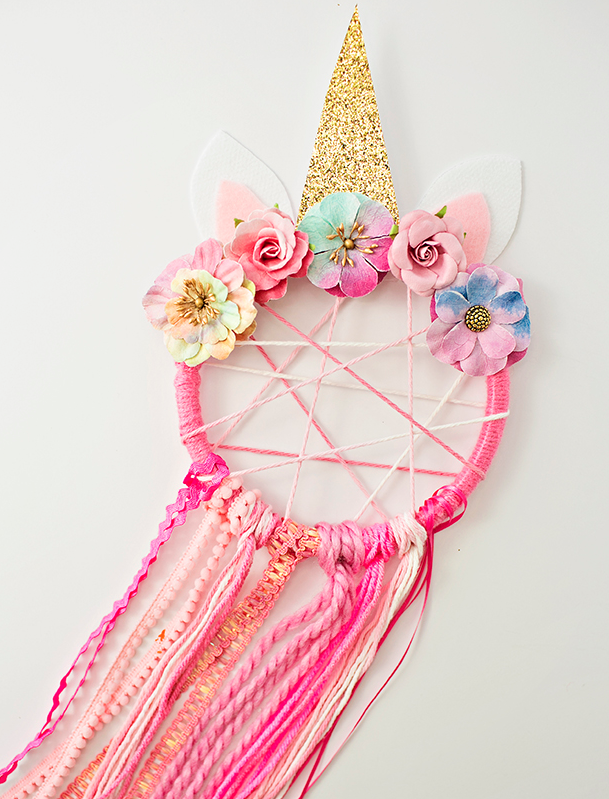 This amazing unicorn dream catcher from hellowonderful.co is an amazing DIY Spring decor idea for kid’s bedrooms! I know my little girl would LOVE this, hopefully I can find some time to give it a go! Remember that you can always just pick up some very inexpensive furniture or storage from Ikea or Amazon, and simply paint it in seasonal colors to suit your mood. 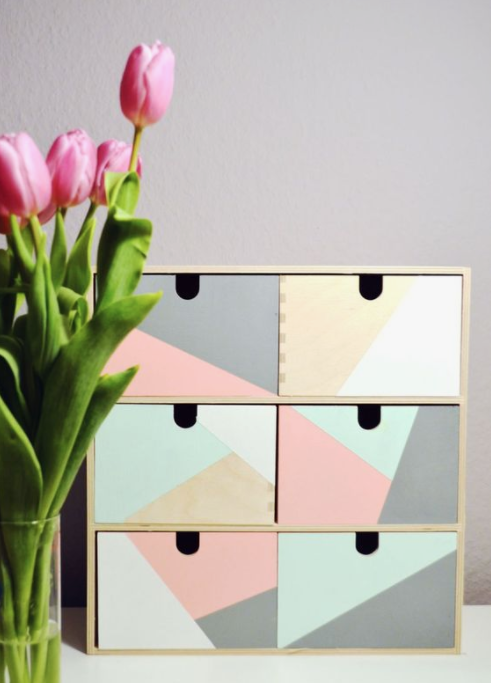 This set of painted storage drawers (onÂ sousou-diysign.de) would transform a dreary desk, and also work well in kid’s rooms to brighten things up and store all their bits and bobs when you do the Spring cleaning (or when you try to get them to do it)! This floral filled monogram would look gorgeous on a bedroom wall. I also thought it would also make a perfect mother’s day gift, what do you think? 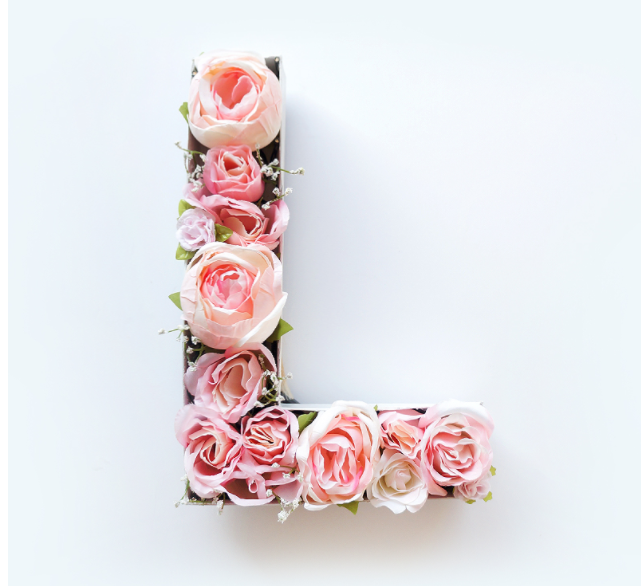 It’s pretty simple to make, you need a paper mache letter in addition to the usual equipment you’d expect – such as your hot glue, fake flowers (like these ones), white spray paint and X-Acto knife. You can find the full tutorial on blog.lulus.com. Cherry Blossom says ‘Spring’ like no other flower! 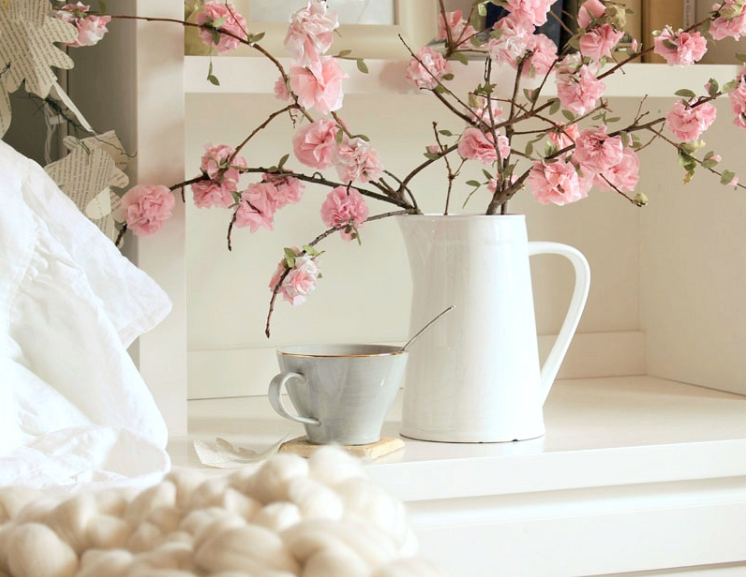 The gorgeous pink blooms are so pretty, and if you’re lucky enough to have a Cherry Blossom tree in your garden then you’ll no doubt already have some beautiful floral arrangements around the house! If you’re not that fortunate though, or if you’d like something a bit longer lasting, you can make these paper Cherry Blossoms to create a stunning display. 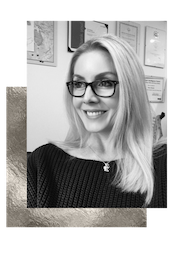 These will take you a little while to make, and you’ll have to follow the tutorial carefully to make sure you get the perfect finish, but it’ll be well worth the effort! 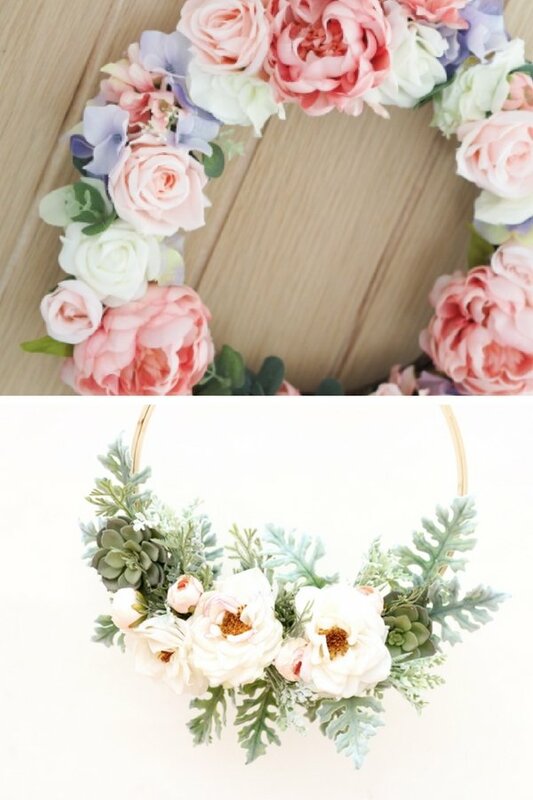 A Floral Wreath will make a pretty addition to your home at any time of year, but I think the two above are particularly perfect for Spring, you just need to decide whether you want to go for full-on floral, or a bit more minimalistic! The top one here uses a wreath base (tutorial here), and the bottom one uses a simple embroidery hoop (tutorial here). 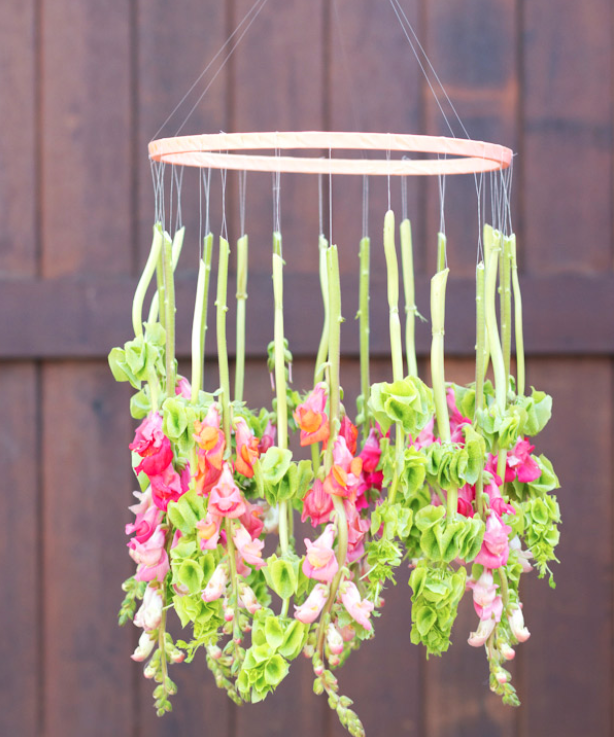 This floral chandelier would make a perfect DIY Spring decor project if you’re after an alternative to the usual dinner table center pieces! You’ll need an embroidery hoop once again, and this particular one uses fresh flowers, but you could of course use artificial if you’d prefer a longer-lasting display! Pop over here for the tutorial. Look at these gorgeous illustrated Spring eggs!! I’m in love with these – I included some amazing unicorn eggs in my Easter craft ideas, which I thought were amazing, and these ones are just as beautiful! The faces on the eggs are transferred on with printable tattoo paper, and the tutorial includes free printables so that you can get it just right – clever! 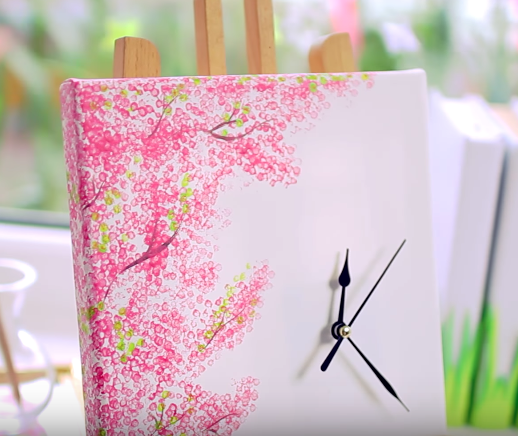 If you enjoy painting, why not have a go at this pretty cherry blossom clock, made with a simple 20×20 canvas? It’s simple to create, and a perfect project for anyone who finds painting relaxing. It’ll add a touch of Spring to your wall, and would also make a beautiful gift. I’ve set the video tutorial below to start at the instructions for the clock, but if you like you can keep on watching it for more gorgeous ideas, including a flower pot pendant lamp and a grass book cover!! 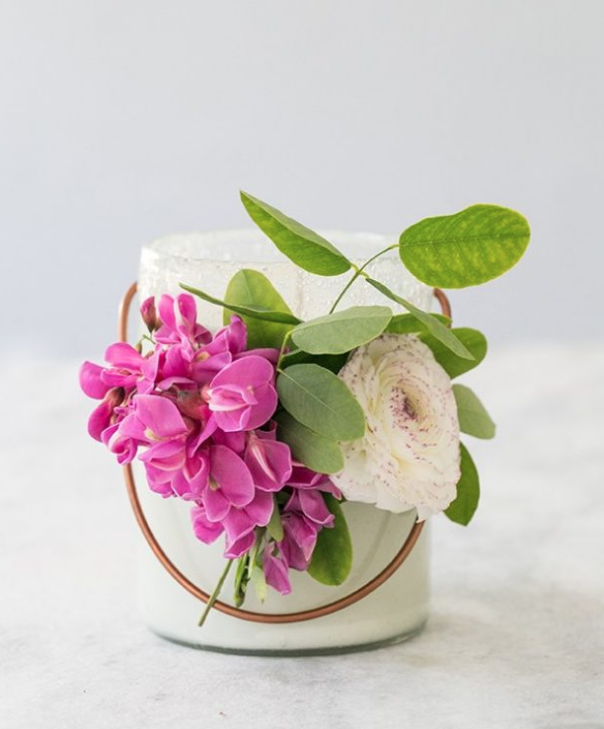 The tutorial for this beautiful Spring candle on sugarandcharm.com takes you right through the process of making a gorgeous scented candle from scratch. If you want though, you can cheat and just tie some pretty blooms around your shop-bought candles! 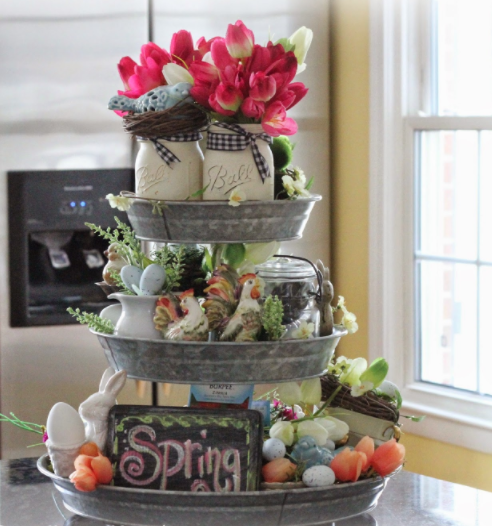 And to finish up… there’s nothing subtle about this eccentric Spring centerpiece – and I love it! You could have lots of fun creating this with kids if you rope them in to help collect the ‘ingredients’ from the garden! You can see all the details on this here. Well, that just about does it! 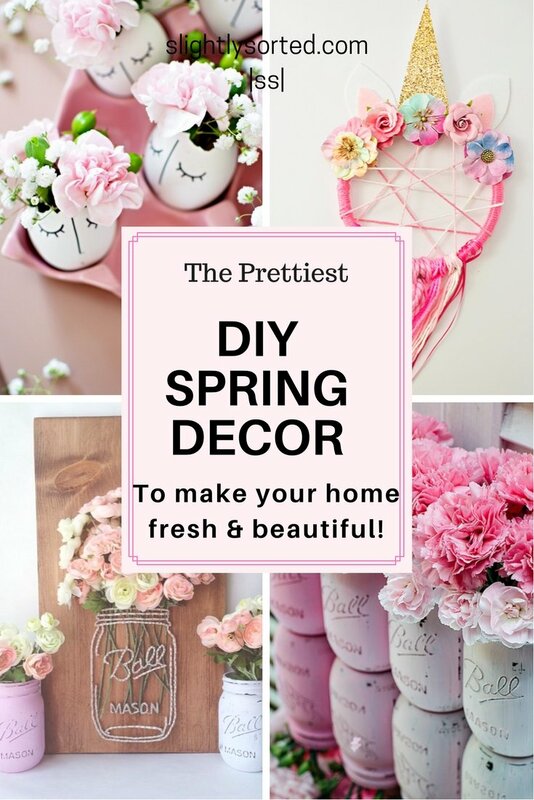 I hope this has helped you with ideas for some DIY Spring decor to brighten up your home – I would really love to hear from you if you’re going to try any of these out, or maybe you already have? Let me know!! P.S. 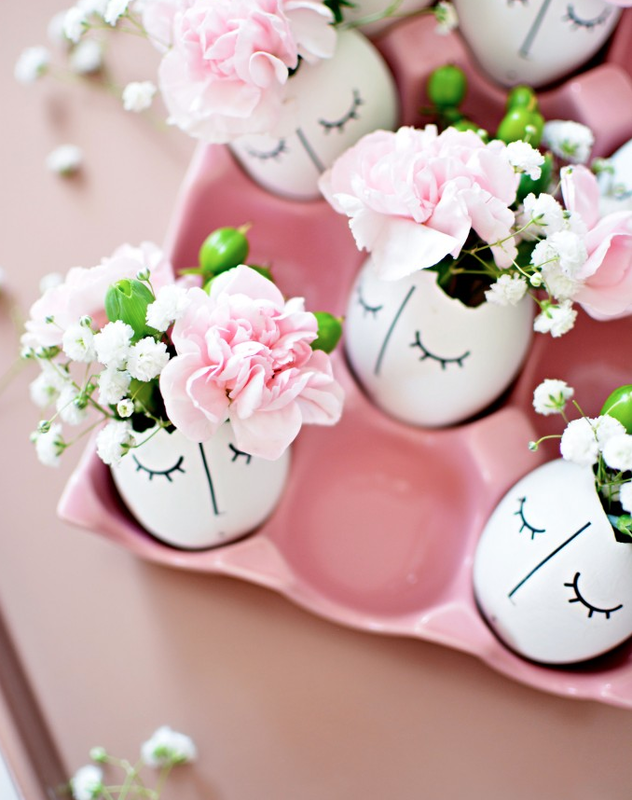 If you’re looking for even more ideas, you might want to take a peek at my top Easter DIY craft and decor ideas – there are some gorgeous ones in there! 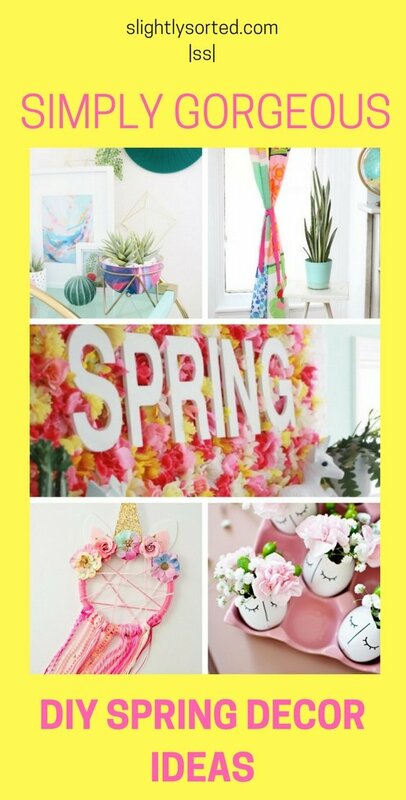 Enjoyed this post on DIY Spring Decor ideas? 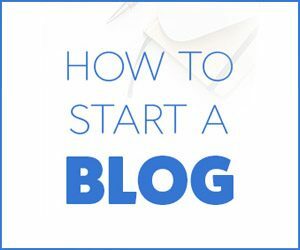 Why not save it for later on Pinterest! Previous Post Bullet Journal Hacks – 14 Genius Ideas To Steal! Next Post The BEST Free Online Stock Photos!